Do you think engineers are really looking for a better UI? The theme of user experience and UI improvements is not new. From time to time, the discussion about UI improvements are coming. From what I can see, there is one thing clearly changed recently. A decade ago, CAD and PLM vendors didn’t think that user experience is something that can a competitive differentiation. Nowadays, they do. That’s it. The PLM experience didn’t change PLM much for the last few years. We’ve heard lot of praising how much UX and experience are important for PLM vendors. And yes, we’ve got nicer user interfaces, pretty colors and superficial marketing demos. The nuts and bolts of PLM system and experience didn’t change. Those systems are clunky and complex. Most of UX work that was done is yet another layer of software applied on top of existing platforms, data models, workflows and… technological limitations. So, it is still a UX lipstick on PLM pig for the lack of better worlds. The situation is even more interesting in CAD software. CAD packages have very long lifecycle. Engineering.com article – The Quest for a Perfect Interface published an interesting interview with William Gribbons is the founder of the User Experience Center and User Experience Studio and the director of the Human Factors in Information Design Program at Bentley University in Waltham, Mass. (article is sponsored by Dassault Systemes SOLIDWORKS). I captured an interesting passage speaking about aspects of UI design. In the CAD world, the early users (of PTC and Autodesk software, for example) operated systems that were very powerful but very difficult to use. A core theme that we address, from a psychological front,is how much are we asking the user to do? How much past learning can we use? From one product to another, or within a product line, what do they have to work differently? Companies want to differentiate themselves, but that imposes a load to the user base. We think about the internal consistency within a product, the transferal from generation to generation of a product. Do you have transferability across multiple products, like SOLIDWORKS and the Dassault Systèmes suite of tools? Should there be consistency and transfer of learning, and should there be an industry consistency even it is counter to the business approach? There are people who learned a CAD package 25 years ago and still look for a job that uses the same package. You look at a lot of these companies—they hire from among their users. That perpetuates this. When you want to innovate, that is problematic. 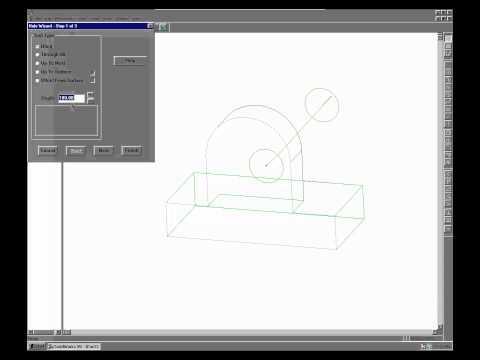 I found the following video showing UI of Solidworks 1995 vs Solidworks 2012. Can give you some ideas about how different and similar these examples at the same time. The article made me think about UI and UX design in a perspective of an overall software lifecycle. Engineers are taking their knowledge and experience very carefully. For many of them, knowledge of CAD system is part of their qualification. As we know, the best tool is not a tool with the best UI and features, but the tool that we are familiar with. So, if engineers are familiar with Solidworks or another tool, it will be still the best tool for them (unless new CAD package with offer some unique features that cannot be provided by old software). According to the same article enterprise systems have a long way to go. Big CRM, ERP and other systems grew up in the world of bad UI. It was the user’s job to figure out how to use the system. Once they did the work, users kept it as a competitive advantage and knowledge that can give them differentiation factors. Similar to CAD companies, PLM and ERP companies are hiring people from their best users and, as a result, not much changes are expected in the way UI / UX is done. Service companies are also leveraging their experience and knowledge of UI/UX to provide better services and not necessarily looking how to make users’ life easier. So, how to change the trend? What force can change the dynamic of CAD, engineering and enterprise PLM software development to provide a better UI and user experience? I can see two possible options here: (1) new vendors and tools; (2) taking human interaction out of UX. Let me explain what does it mean. New vendors and software tools developers have a chance to start from a clean sheet. It can unlock their imagination and release them from a commitment to comply with old rules and respect existing orders. According Engineer.com article, this is what SOLIDWORKS did when started 20 years ago. Taking human interaction is another interesting opportunity. While a typical enterprise UX keeps any workflow 10 clicks away from a user, the remove it entirely and replace with something else can be a cool option. Think about speech-driven UX, chatbots and other options that technically eliminating user interaction and the problem itself. – Users don’t want to see whole lot of menus, tool bars, pop up menus, right click actions. Ability of an application to achieve reduction in complexity with only configuration and without custom coding is highly desirable. PLM/CAD applications should provide coarse grain and fine grain control to tweak interfaces based on user, role, group, application context etc. New engineers are overwhelmed with amount of information displayed on screen. I have seen hierarchical menus occupying complete screen :-(. – Capability for administrator to set up sample client and distribute to all users. I have seen examples where some user settings are nice, but cant be cached for next session. I must also say, in spite of complaints by users ( number of button clicks, accessibility etc), implementation team never seem to find time and resources to perform all the configuration changes to arrive at an optimum interface. In my opinion, the application vendors should come with new UI/UX for most commonly used operations such as search, upload, download data and not attempt to do every other thing that we can think of with data. As you have rightly pointed out, selling to new UI/UX to existing users is not going to be easy if there is no easy and proven migration strategies. Correct. Once implemented and trained its difficult to change even if its better. For satisfying multiple interests, I was indicating that consistent controls, configurations should be made available from product vendors. User interface should be about ease of understanding and use. Take a look at spellcheckers in modern word processors. Nicely sitting in the background, silently doing its job, popping up when needed. That’s the user interface we need. Jeppe, could not agree more- ease of use is the most demanded thing from UX/UI.